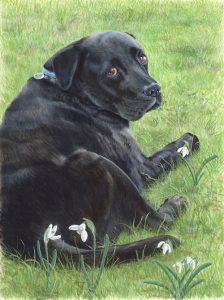 This beautiful and very friendly black labrador is called “Monty”. This is the second time I have portrayed him (the first was a graphite drawing, see Artist Code 0905). Sadly Monty passed away a couple of weeks before I completed him in March 2017, but his memory lives on in those beautiful “I love you” eyes. He loved his weekend outdoor life!